A vital part of any small to mid-size business is its ERP applications. This dynamic solution was available only on the desktop thus far. While the application is useful for businesses, it has its limitations when it is only accessible on the desktop. Businesses that have employees on the road making sales and deals need instant access to the data to obtain higher sales, close bigger deals and make on-the-spot decisions. Mobile commerce integration with Microsoft Dynamics GP is the answer many businesses are looking for. Sales people can access all the vital information that is necessary to close sales while out in the field. This information includes creating sales orders, managing inventory, accessing sales order history and any other pertinent information that is included in your ERP system. This enables sales people to function more efficiently and effectively while out in the field, increasing productivity and profits all at once. On-the-Spot Access – Mobile commerce users can instantly access their inventory, confirm pricing and create a work order right at the point of the sale. This enables them to answer all questions at once and complete the sale without return trips or phone calls. Exceptional Customer Service – Users have the ability to answer customer’s questions right there on the spot rather than delaying them and taking the time to return to the office to determine the answer. Instant Integration – Microsoft Dynamics instantly integrated with your mobile commerce, giving you instant access all the time. On-the-Go Payments – Anyone can make payments while your representatives are out in the field, enabling business to move quickly and efficiently and eliminating the need for redundant paperwork. More Time for Business – When your representatives have access to the required information all the time, they can focus on increasing sales and finding new business, rather than dealing with back-and-forth between the office and the customer. Integration of Mobile Touch Points – All transactions are updated in real-time giving everyone accurate information all the time. Accessible Features – Multiple warehouse sites, units of measure, on-hand quantity information, standard pricing, extended pricing, inventory, user-defined fields and item templates are all available on the mobile application. Reduced Sales Cycle – The sales process becomes efficient, enabling companies to become more profitable and stable. Increased Productivity – Field representatives realize a better use of their time by having instant access to all the required information to complete and process sales. Delivery – All factors that tie into delivery, control and supervision of products are easily handled. Complete Service in Shorter Time – You can offer your clients a complete service, from the sale to delivery of the product, in a much shorter amount of time. The bottom line is the mobile commerce integration with Microsoft Dynamics GP helps field representatives create higher sales, increase productivity and operate more efficiently while out in the field. 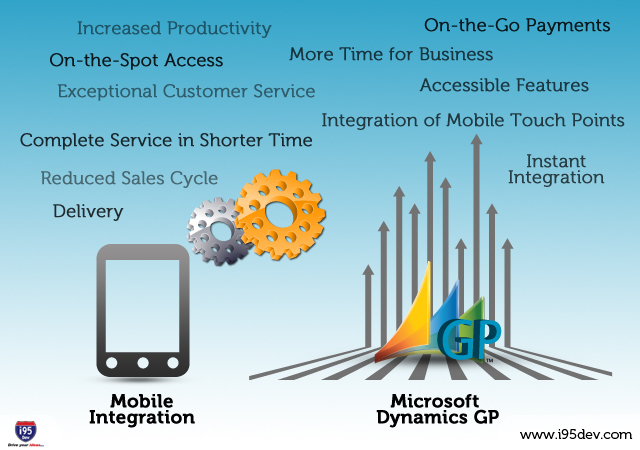 For more information about mobile integration with Microsoft Dynamics GP, feel free to give us a call at 301-760-7499.